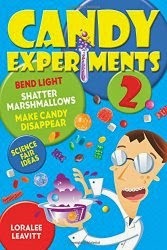 Candyexperiments.com was just featured in a newsletter by homeschooling-ideas.com. Besides the blurb for candy experiments, there's also a great (and short!) animation of a black hole swallowing a star, sidewalk chalk art that's unbelieveably realistic, and a scrapbook with a picture of a medieval undercroft I'm sure I've visited. What fun!